You can author and share web scenes containing the results of your Space Time Pattern Mining analysis. The interactivity of web scenes can be very useful when telling the analysis story and sharing and communicating your findings. The following steps reference a 3D web scene created for the story map Analyzing traffic accidents in space and time. 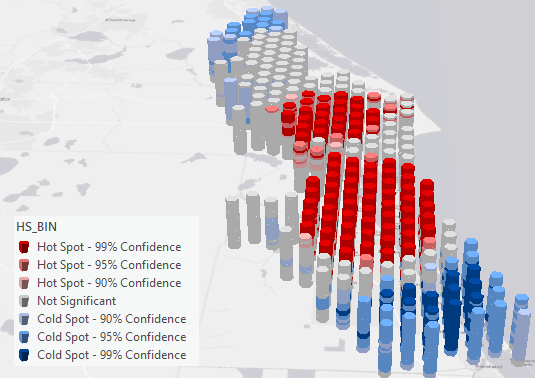 After running the Emerging Hot Spot Analysis or Local Outlier Analysis tools (this example uses Emerging Hot Spot Analysis results), insert a New Scene. 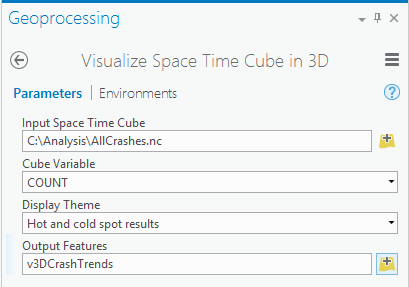 In the Scene view, run the Visualize Space Time Cube in 3D tool (or use the Space Time Cube Explorer Add-in), pointing to your existing .nc cube containing the analysis results on disk. You may need to increase or clear the Visibility range by right-clicking the layer in the Contents pane and selecting Properties, which opens the Layer Properties window. Turn off Elevation Services by clicking off any Ground layers that appear in the Elevation Surfaces group in the Contents pane. Right-click the layer in the Contents pane, select Properties and click Display. 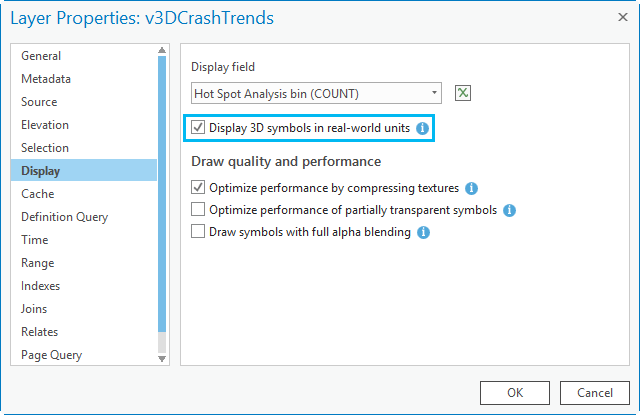 Check the Display 3D symbols in real-world units check box. For Display field, choose Hot Spot Analysis bin (COUNT). 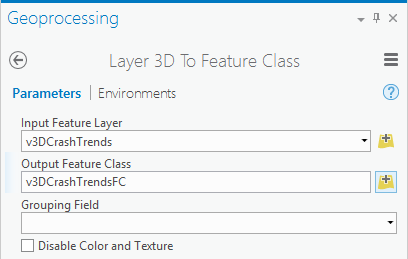 The Layer 3D to Feature Class tool (step 6) will not work unless the layer is using real-world units. Right-click the layer and select Symbology. In the main Symbology pane (with Unique Values in the drop-down on top) click the menu button and select Vary symbology by attribute. Expand Size if necessary. Clear the Maintain aspect ratio check box. The Height and Width options control the height and width of each bin. To optimize visualization of your cube, these values can be adjusted. This example uses a Height expression of 330 and a Width expression of 1800, but you can experiment to find optimal settings for your data. 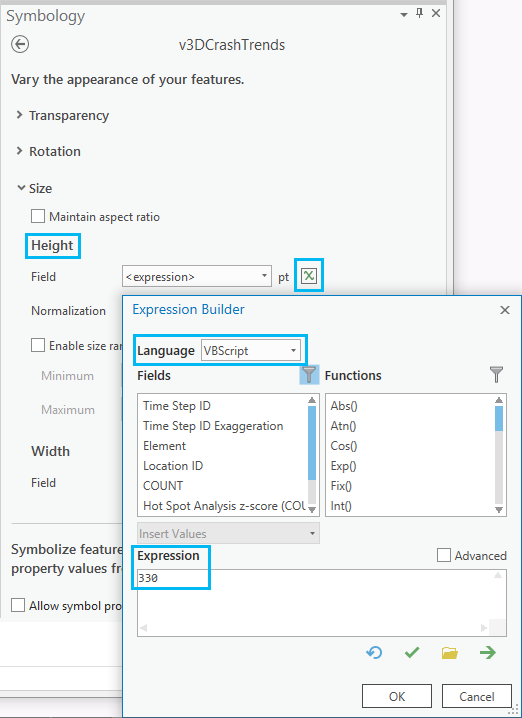 (Click the set expression button to the right of the Height and Width fields to enter an expression). These values will be specific to the size of your space-time cube and the number of time slices it represents. You will want to make sure the settings leave a little vertical gap between the space-time bins. Run the Layer 3D To Feature Class tool to convert the extruded symbols to a multipatch feature class. 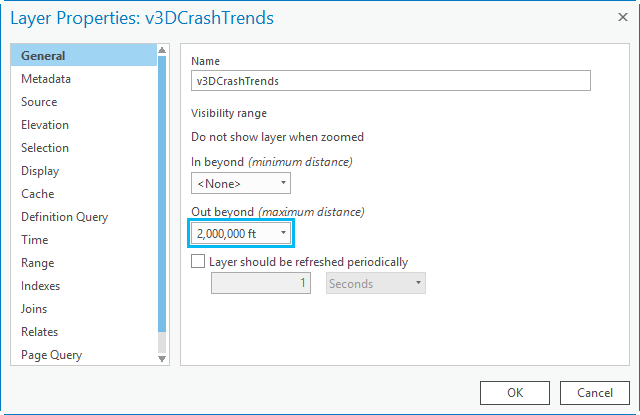 To configure the pop-ups, first create any fields you want to display in the feature class you created in step 6 (v3DCrashTrendsFC), for example, Clustering and Significance fields. Right-click the feature class you just created and select Configure Pop-ups. 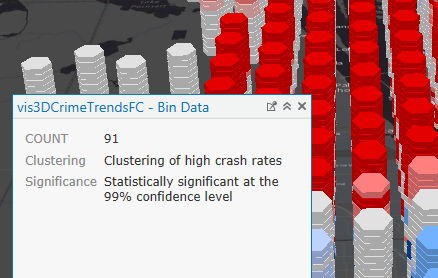 In the following screen capture, the title has been changed to Bin Data and set to only display the count, clustering, and significance fields. On the Share tab in the Share As group, click Web Scene . (Make sure you are signed in to ArcGIS Online or a portal. If you are not signed in, the Web Scene option will not be available.) The Share Web Scene pane appears. Enter a name, a summary, and tags for the web scene and click Share. Once the scene has been successfully shared, click the Manage the web scene link to administer the web scene. It can now be shared with others, used in a web app, or added to a story map. 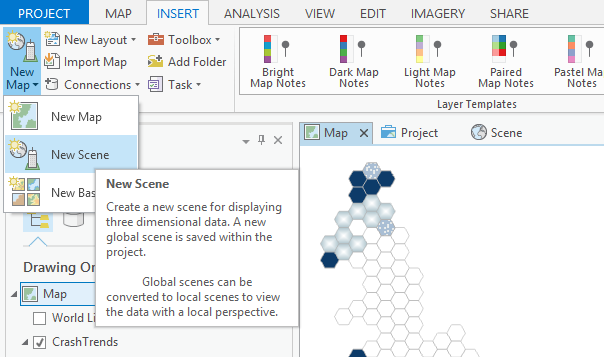 Select Open in Scene Viewer to change the basemap, select either default or ArcGIS Pro navigation, and set the zoom and tilt. You can also configure the layer to include the pop-ups you created. See Author a web scene and Share a web scene for more information.